"Sea _to_shining_sea code" activated in order as Q posted" ? ? bigD111, Hotmess, Moon Rocks, TheCoffeeFairy likes this! Pointed out yesterday that they couldn't get in front of a camera fast enough to say the words "constitutional crisis" and if they couldn't get a camera they were on twitter saying those two words. bigD111, Chevis, Hotmess, Moon Rocks, TheCoffeeFairy likes this! Since Rosenstein has already been confirmed by the Senate for the position he now holds, he may not require another confirmation to move to another post within that department. I currently have nothing to back that up, but am simply speculating. It is similar to the situation we have discussed concerning Francisco (Solicitor General, #3 in Justice Department) moving up to the Deputy AG position if Rosenstein were to be fired. As Q pointed out, since HE had already been confirmed, he required no further confirmation to move up. And so far as I know, the Dems trust him. Not sure if i do, but maybe he has been playing the long game, and Trump trusts him. The speculation is that the acting AG Whitaker will be the one making the indictments, then Rosenstein will be appointed AG. When he is all comfy in his new office, reality will strike. He will be duty bound to prosecute. There will be no way to prevent the cases going forward. He is the Judas goat. In stockyards, a Judas goat will lead sheep to slaughter, while its own life is spared. It is the perfect role for the weasel. He will end his career as a pariah. His reputation will be ruined. Aquarius, bigD111, Billy, Chevis, Hickory, Hiker Trash, Karu, Kels, Martini and Cigar, Moon Rocks, Sami, SouthernBelle, TheCoffeeFairy likes this! (11-08-2018, 11:10 AM)Hickory Wrote: Since Rosenstein has already been confirmed by the Senate for the position he now holds, he may not require another confirmation to move to another post within that department. I currently have nothing to back that up, but am simply speculating. It is similar to the situation we have discussed concerning Francisco (Solicitor General, #3 in Justice Department) moving up to the Deputy AG position if Rosenstein were to be fired. As Q pointed out, since HE had already been confirmed, he required no further confirmation to move up. That would be a great way to go out, lol. Just concerned, we've seen enough of their antics and desperation. Once he is put in, he cannot be removed by Trump! 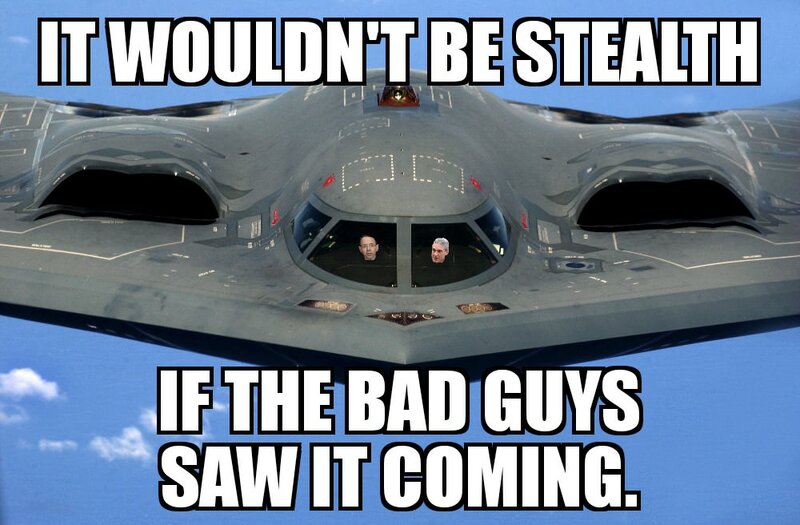 We know what would happen! I just don't feel good about this. Even if he did make a "deal" with Trump to do it this way. bigD111, Chevis, TheCoffeeFairy likes this! And someone needs to remind these folks that we've had a Constitutional Crisis in this nation since around 1962, and THANK THE GOOD LORD that we have President Trump and his Team to correct this Crisis !! bigD111, Billy, Karu, Moon Rocks, TheCoffeeFairy likes this! I woke up this morning to stories on fb about Ruth Bader Ginsburg having fallen and cracked/broken ribs. Then someone shared this article and it claims a return of cancer. Funny thing is the article is dated Nov. 9, 2018 (tomorrow) Pre-planned stories for her imminent departure? Hmmm, I just noticed as I previewed this post before posting that the url has 2018/09/27, so maybe the article was just re-dated and published again? Either way, she needs to go so POTUS can replace her with someone worthy of the position. Here's to the crazy ones. The misfits, rebels, the trouble makers. The round pegs in the square holes. The ones who see things differently. They are not fond of rules and they have no respect for the status quo. You can quote them, disagree with them, glorify or vilify them. But the only thing you can't do is ignore them, because they change things. They push the human race forward. Because the people who are crazy enough to think they can change the world, are the ones who do! Aquarius, bigD111, Billy, Hiker Trash, Sami, SlowLoris, SouthernBelle, TheCoffeeFairy likes this! (11-08-2018, 02:01 AM)Sami Wrote: Matthew G. Whitaker is a hatchet man. Take the time to read this, not long, written Nov 2017. Link below from Wictor's video on Utube, also in above tweet. Imagine if the new acting AG now releases all previously 'blocked' doc requests by the House (including the [RR] secondary CLAS scope doc). The 'Red Line' months old 4am narrative should be updated. "..or in response to chaos associated with protests and mob action,"
Looks like our wishes will come true.. The indictments will be released and these people not the high ups but their cannon fodder will be instructed and brainwashed to go batshit crazy. 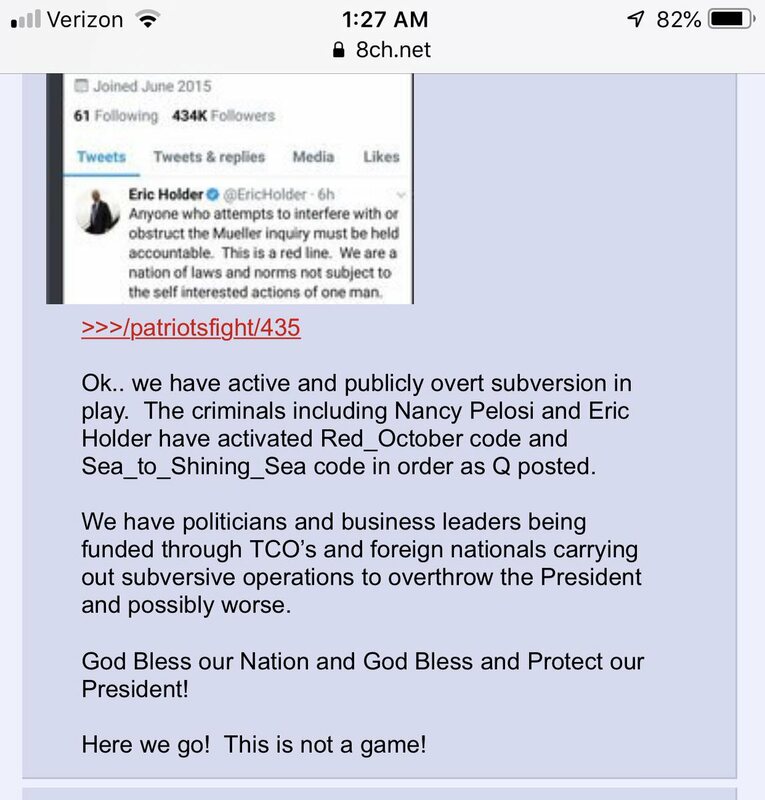 Hope everyone is ready because they will need us Patriots for the clean up on isle 5..
Nobody wants this but it needs to happen..These people and there followers are sick and wanted/still want us destroyed. 3 types of People will go batshiit crazy and Martial law will be declared. Keep a very close eye,very close eye on Q drops and other reliable news outlets. When this goes down it will go lightning speed on the POTUS end. We Patriots will be ok. All the red areas are vast and large in our country and believe me the Military will protect and secure those red areas first or as best they can. Patriots won't loot or cause problems (the ones that do will be sorry) So I see Groups of Patriots banding together during this time of Martial law. If your in a heavy Blue zone then right now today put in motion a plan to flee long before the left lunatics start there reaction.. Pile the family and animals in the fully loaded car and drive to a police/sheriff or federal LEO building far away from the blue infested danger zone and into a solid red zone. Be prepared to "camp out" in the LEO's parking lot. You will be safe. Or find a place that you know you and your family will be safe. Maybe a church in a good red zone. Only head to the "Hills" if you have trained and know what the F your doing especially if you have a family.. You'll get F uped by thinking your just camping..
Hopefully not to off Q topic but with post 2445/6 seems like this is going to go down. PS carry an American flag full size or smaller. You will be surprised how that flag will help you or you and your family out when this goes down. Aquarius, bigD111, Billy, BirdLady2, Chevis, Deplorable Michele B, Hickory, Hiker Trash, Kels, Moon Rocks, rikster111, Sami, Sassy, Slappy Kincaid, SlowLoris, SugarLips, TheCoffeeFairy, ~hannah~ likes this! And someone needs to remind these folks that we've had a Constitutional Crisis in this nation since around 1 9 862, and THANK THE GOOD LORD that we have President Trump and his Team to correct this Crisis !! Okay, I am going to try to answer your question, but I was really hoping that one of the people who say that it is a code would explain it, because I am with you! I need it explained, too. The other three drops are Qanon.pub #'s 2039 (Aug 31), 1682 (July 24), and 902 (March 9), none of which appear to be hints at codes. There are 12 drops that contain 'Red October', but only the one above (#395) appears to be connected with possible 'codings'. However, Q did point out that 'Sessions being out and Whitacre being in' occurred on the anniversary of 'Red October' (Bolshevik Revolution), so Q may have been hinting at that date as being critical all along, but Q has also posted that things can have multiple meanings, too. My Conclusion: 'From Sea to Shining Sea' and 'Red October' very well may be code expressions, but they appear to me to be encoded for US, not the DS. I personally have seen nothing that makes me think otherwise. But I am VERY open to being shown a different aspect of these if someone want to explain it. Aquarius, Hiker Trash, Karu, sloonie, SouthernBelle, TheCoffeeFairy likes this! Videos in link. I hope that this is not allowed to go uninvestigated. Aquarius, bigD111, Billy, Chevis, Hickory, Hiker Trash, Hotmess, Karu, Looky, rikster111, Sassy, SouthernBelle, TheCoffeeFairy, ~hannah~ likes this!